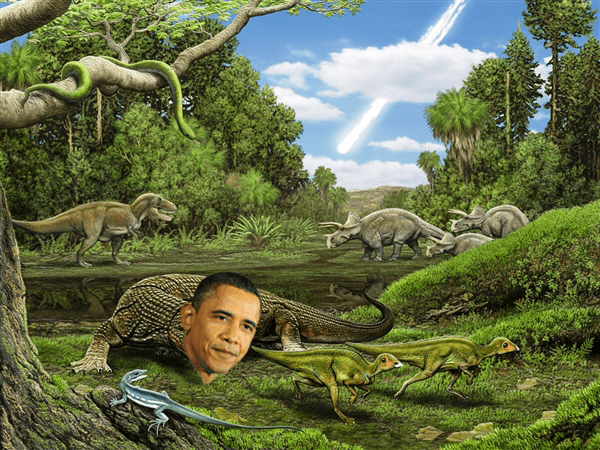 The mass extinction that wiped out the dinosaurs 65 million years ago also terminated most of the lizards living on our planet at the time – including a newly identified creature that’s been named Obamadon gracilis in honor of President Barack Obama. This is when you know you’ve made it big – when you’ve already had a fish (Ethiostoma obama) and lichen (Caloplaca obamae) named after you, and people still find more creatures to borrow your name – although a foot-long, slender-toothed casualty of the Cretaceous-Tertiary extinction is not the most dignifying animal out there. Nicholas Longrich, a paleontologist at Yale was the lead author of the paper, which was published in the Proceedings of the National Academy of Sciences, and he explained he got the idea from a conversation with a friend, when they were wondering how the 2008 Obama election would change the scene. However, don’t let the anecdote fool you – the study is extremely serious and shed some light on the environment at the time, showing how even previously recorded samples can be useful; they analyzed 30 different types of snakes and lizards, previously collected from locales in western North America ranging from New Mexico to Alberta. Out of these species, nine were previously unrecognized – including Obamadon. Two of the newly analyzed fossils have yet to be given names, and Longrich has some great ideas – but he assured us it won’t be anything TOO crazy. “We decided not to do the Hitlerosaurus,” he said.